Democrats are coming out swinging against the Department of Justice's move to back a lawsuit brought forth by a group of Republican attorneys general against the Affordable Care Act that, if successful, could result in the dismantling of some of the most significant parts of the health care law. The Senate's top Democrats fired off a letter to President Trump on Friday to denounce the decision and urged Trump's Justice Department to reverse course. "Mr. President, it is time to stop the sabotage. We are a country of laws, and the law must be respected, defended and enforced regardless of the person occupying the Oval Office," the senators wrote. The letter was signed by Sens. Chuck Schumer of New York, Dianne Feinstein of California, Patty Murray of Washington, and Ron Wyden of Oregon. "The American public widely supports retaining protections for pre-existing conditions. We implore you to listen to the voices of career Justice Department lawyers, as well as concerned families, patients, doctors and hospitals that want to retain these protections, and start working with Democrats to strengthen our health care system instead of trying to tear it down," the senators said in their letter to Trump. “We won’t sit back as Texas and others try yet again to dismantle our healthcare system. Our coalition of states and partners across the country will fight any effort to strip families of their health insurance," he said. 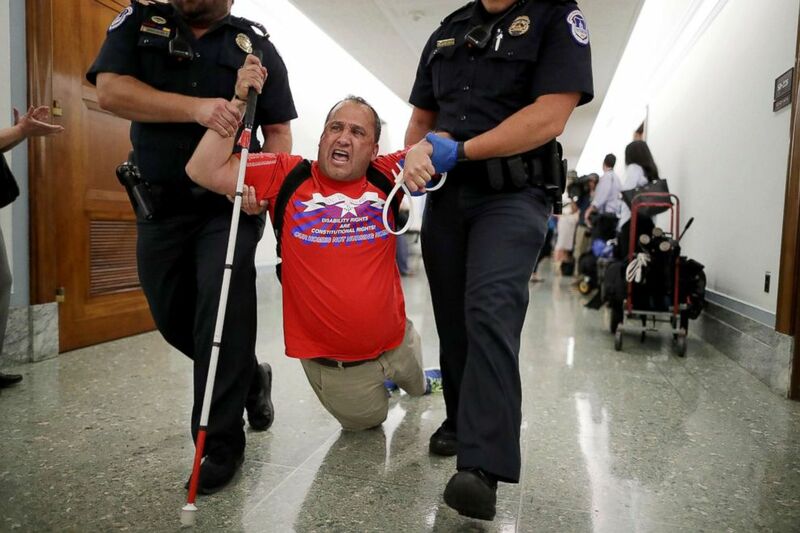 Capitol Police drag a blind protester out of a Senate Finance Committee hearing about the proposed Graham-Cassidy Healthcare Bill in the Dirksen Senate Office Building on Capitol Hill, Sept. 25, 2017, in Washington. If the Trump administration’s argument prevails, insurers could once again be able to deny Americans health insurance based on their health status. “This is disgusting but not surprising. A year and a half into sabotaging Americans’ health care, this may be President Trump’s meanest effort yet – he is working to let insurance companies refuse to cover sick people," Sen. Chris Murphy, D-Conn., said in a statement. "Think about that for a minute – the president of the United States is actively working to give corporations the power to tell moms, dads and kids that they can’t get the health care they need to stay alive. And Republicans in Congress are letting him do it." "The entire point of insurance is that it should be there when you need it. No one in Connecticut – or anywhere – should have to fear that they or their loved ones will be kicked to the curb and refused care when they need it most. The White House needs to hear that the American people will not stand for this,” Murphy said. “In particular, this decision could lead to insurers denying coverage to the 130 million Americans with pre-existing conditions. This is harmful to the health of these Americans and is very short-sighted considering the nation is in the midst of an opioid epidemic and 30% rise in suicide rates. We call upon the Administration to reverse this decision and defend the rights of our patients," Stewart said. But some moderate Republicans, including Sens. Lisa Murkowski of Alaska and Susan Collins of Maine, previously helped tank Republicans' efforts to repeal and replace the ACA citing their concerns over the possible elimination of coverage for people with pre-existing conditions. "While much about health care is complicated, one thing is clear as we move forward: both parties need to work together to address the instability and high costs plaguing our health care system," Collins said. "This announcement from the Administration does nothing to ameliorate the current system’s instability or foster cooperation toward a solution to lower premiums and increase choices for consumers. Instead, it exacerbates our current challenges and creates further uncertainty that could ultimately result in higher costs for millions of Americans and undermine essential protections for people with pre-existing conditions, such as asthma, cancer, heart disease, arthritis and diabetes," she said.